What’s The Craziest Failed Flying Car? Our society has nursed something of a flying car obsession for the past 70 or 80 some odd years. Even though every attempt is marred by failure, people just keep trying to make cars go where they shouldn't. 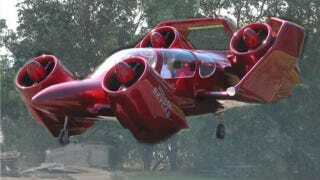 Perhaps the most insane venture has been Paul Moller's flying cars. He lives and works in my hometown of Davis, California and we'd get to see him show off his totally-custom prototype to the high school every year. That is, every year we'd get to see it sit resolutely on the ground, going nowhere. What's the most insane failed flying car that was actually built, and why did it crash and burn?